An evening of Dixieland jazz! Join us in the marvelous acoustics of St. John’s Church for a foot-tapping delight. Standards, old-time hymns, and fun abound. 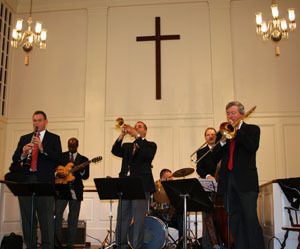 The Hot Cat Jazz Band was founded in 1990 by Wethersfield trumpeter Ross Tucker, and has a huge repertoire of jazz that they perform at parties, events, and worship services. The concert is free admission, suggested donation $20. The Hot Cats pride themselves in presenting a very wide range of styles to please all ages. Their repertoire includes Swing standards of George Gershwin, Cole Porter and Duke Ellington; Big band hits of Benny Goodman, Glenn Miller and Tommy Dorsey; Popular songs from the 1920’s; Hymns and Worship songs; and New Orleans Dixieland favorites.